As we all know, the perfect dash of colour and edginess for your Instagram feed is best provided by a graffiti background. So which cities are home to the artsiest backdrops across the globe? Here are some of the best areas for awesome street art around the world. George Town is Insta-famous, and for good reason (seriously, peep its hashtag). What makes George Town’s graffiti so unique is that they often include real physical objects and will incorporate a spot for the model (you) to pose as part of the scene. Known as the Street Art Capital of Asia, you’ll be ‘gramming at every corner in this town. Melbourne is known for its graffiti alleys, which are located right in the heart of the city and take up entire walls and Instagram feeds. Hosier Lane and AC/DC are a couple spots you definitely need to check out, but you can find awesome street art all over the city. Barranco is a vibrant, popsicle-coloured breath of fresh air. Not only are the colonial-style buildings here fashioned in adorable pastel colours, but the street art is off the hook. Check out areas such as the Bajada de los Baños pathway or the area around the Bridge of Sighs for incredible larger-than-life works of art. Shoreditch is known to be the trendy and alternative area of London, and what says trendy and alternative more than a plethora of street murals? Hit up areas like Rivington Street or Fashion Street for some beautifully creative art. As the festival capital of the world, Montreal was not about to leave out the Mural Festival. Drawing artists from around the world to create masterpieces, this 11-day festival paints the town with photogenic works of art. Stroll around Saint-Laurent Boulevard for the best spots, and don’t forget to check out the massive painting of Leonard Cohen. New York is effortlessly Instagrammable, and you can find murals scattered throughout the city. Check out the Audrey Herpburn mural on Mulberry Street or the many heart-covered doors in Nolita, the vintage postering in Freemans Alley or the different murals lining 1st Street and 2nd Avenue in the Lower East Side. Hong Kong is instantly recognizable in its Instagram backdrops, and aside from the epic skyline, many of these come in the form of street art. Check out the hipster mural on Graham Street in Central for one of the most photographed spots. Cape Town’s edgier neighbourhood of Woodstock is chock-full of ‘grammable street art. With just enough grit to earn you that street cred for your followers, check out areas like Victory Road and Albert Road near Essex Street and Barron Street. If you haven’t heard about Seville’s thriving street art scene, now you know (and knowing is half the battle). There are beautiful artistic displays lining the streets, and the City of Seville has even paid artists to liven up some areas that needed a little extra oomph. The best areas are the Poligono San Pablo neighbourhood and east bank of Guadalquivir river, as well as the Plaza de Armas bus station and nearby skate park and bridge. 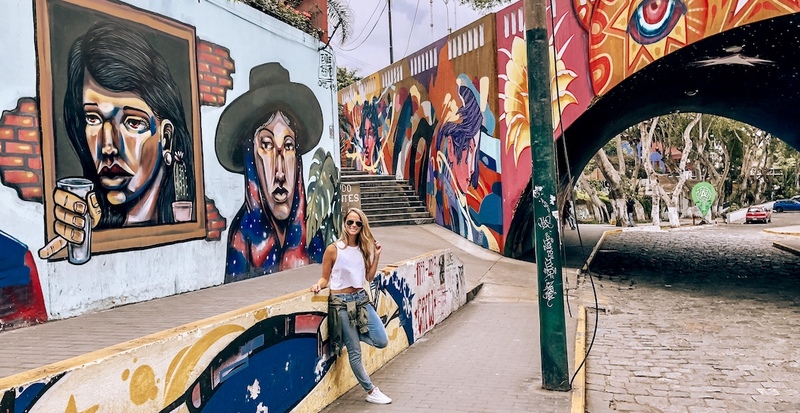 Rio is covered with stunning displays of street art across all neighbourhoods, but the charming boho neighbourhood of Santa Teresa is truly an art lovers’ dream. Don’t forget to stop by the Selaron Steps in Lapa, which is where Snoop and Pharrell filmed the music video for “Beautiful.” Also check out the GaleRio in Botofogo or the Praça Mauá in Centro – fun fact, the latter is home to the largest street mural as certified by the Guinness Book of World Records, created by Eduardo Kobra. Lining the streets of scooter chaos, you can find some beautiful murals depicting the life and culture of Vietnam. Check out the murals under the archways on the railway viaduct on Phung Hung Street for captivating artistic expressions. LA has absolutely nailed the Insta ops on every corner, and hotspots like Venice Beach and West Hollywood are scattered with walls just waiting to be your backdrop. Check out the black-and-white palm tree wall by Noah Abrams or multicoloured cougar by Louis Masai of Abbot Kinney, or the infamous pink wall of WeHo.